NOW® Cinnafresh Mouthwash is an effective fluoride-free oral rinse that works in unique ways to help you achieve a smile that's healthier and brighter than ever before! Cinnafresh Mouthwash gets its cleansing properties from xylitol - a naturally occurring sugar alcohol that has been shown in clinical studies to help promote dental health; effectively rinsing debris, such as, food particles containing bacteria from mouth surfaces. 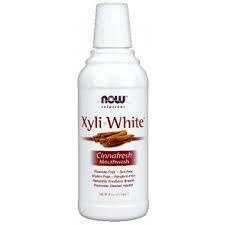 Xylitol also helps safeguard healthy tooth enamel surfaces. By preventing the mouth's pH levels from falling below their normal range, Cinnafresh Mouthwash protects the enamel surface of teeth. Shake gently before using. It is recommended that you first brush with Cinnafresh Whitening Toothpaste and then rinse mouth for at least 30 seconds with Cinnafresh Mouthwash. De-ionized Water, Certified Organic Aloe Vera Juice, Xylitol, Vegetable Glycerin, Natural Essential Oil Flavor Blend (Ceylon Cinnamon Bark Oil, Thyme Oil, Tea Tree Oil, Natural Vanilla Flavor, Cassia Oil, Nutmeg Oil, Fennel Oil, Natural Menthol Crystals), Caprylic/Capric Mono-Diglycerides, Lauric Arginate (preservative), Citric Acid and Grapefruit Seed Extract.